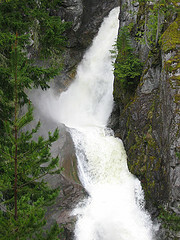 Squamish Hiking trail to High Falls. It’s tough. 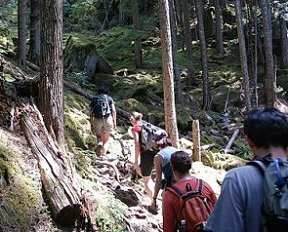 A Squamish hiking trail is generally a tough one due to the mountainous terrain. Most, such as the Stawamus Chief trails are user friendly with most of the snags and debris removed for easier footing. The High Falls hiking trail is a little different. It’s tough. It’s steep. It’s rocky. It’s long. It’s a great trail. It's Squamish hiking at it's best. 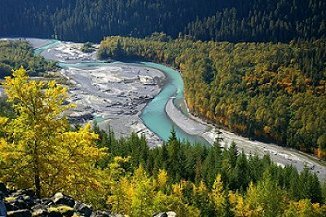 This may not be the perfect hike for you to consider if you are just starting out in the sport of hiking trails in BC. It’s a 12 kilometers return trip. The elevation gain is 650 meters. It’s a steady, steep, rocky, climb. Part of the trail has heart stopping drop-offs. Chains and ropes are in place for your safety. Other than those concerns it is a wonderful trail with fantastic views of the valley and surrounding Tantalus Mountain Range. The flora and fauna are incredible. Black bears live in the area that you should be aware of. It doesn’t hurt to take along a whistle and use it every once in awhile to let them know you are walking through their homeland. Bald eagles, red and white tailed hawks, humming birds as well as squirrels and deer will keep you alert. It’s a good idea to take along a lunch to have on the trail. Water is available from the creek in places but not always readily accessible. The whole hike takes about 5 hours including the lunch break. That's what Squamish hiking is all about. The trail can be very slippery. On a rainy day you must be very aware of slippery rocks. Its steepness adds to the danger. If you stay alert to your surroundings and the weather conditions you should be fine. This is a fine trail for a group of hikers in good condition. The camaraderie atmosphere of the group will take your mind off of the steepness of the terrain. Our experience is that the more the merrier and the greater variety of cookies and sweets the better. We call it trail fuel. To get to the beginning of the road into the trail you should leave Whistler and travel south on Highway 99 until you see the sign for Alice Lake Park on your left. From Squamish you drive north on Highway 99 to Alice Lake Park on your right. Across the road from the Park is the Squamish Valley Road. Enter here. At 3 km in you want to keep left at the fork. Continue for approximately 20 km. The asphalt runs out and you are now on gravel. Stay on this winding road pass a bridge on your left over the Squamish river, followed by a crossing over a wooden bridge at a power station on your right. Shortly after that you’ll notice a bridge over High Falls Creek. You should park your vehicle just before the bridge. The trail-head is just over the bridge and is marked by a small sign. The trail starts out fairly easy but it doesn’t stay that way for long. Because it is steep you will find it has an uneven surface with some rocks and lots of exposed roots. You will need to watch out for wet moss as it can be very greasy. Squamish hiking is tougher than most areas. Take note of some of the nice wild flowers on some of the shrubs. You will be traveling through mixed forest of Douglas fir and cedar with some hemlock. You will be traveling along the edge of a very deep canyon at times and you should use the braided ropes and chains to assist you with getting over some of the steeper spots. After about 15 minutes you will come to the first viewpoint where you will enjoy the view of the river and the surrounding mountains. At the one kilometer point you will get your first sight of the falls. It’s a great spot for a water break. From here you will scramble up over steep terrain using the ropes to assist you. Folks at Squamish hiking think of everything. Your next wayside point is at the 2 kilometer area where you will see another viewpoint with a no exit sign. It’s only about a 5 minute walk to the close up view of the falls. This is a cool spot on a warm day and you may want to sit awhile before you will now climb over more rock using the ropes again. Climbing up over another steep area, in 10 minutes you will come to a very nice bluff overlooking the valley. This is a perfect place for your well deserved lunch. That’s the hardest part of the trail you just hiked and it’s now behind you. Now you will enter a nice mature forest of Douglas fir where the shade will be a welcome reprieve after the hot climb. Continue a short distance and you will intersect with the High Falls Forest Service Road where you will have a choice. Either enjoy the view and turn around and go back the way you came up or, follow the road the 1.5 kilometers back to your car. One good suggestion we should make is if you are traveling in two vehicles is to drive one up to the top of the forest road, leave it there and go back down and leave the other one at the trail-head. This will save your knees and leg muscles. 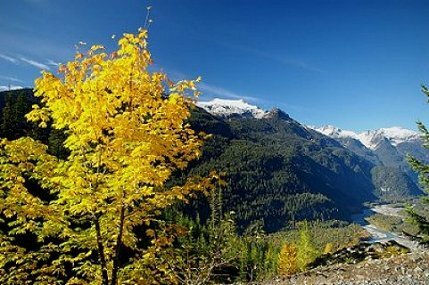 It will make your memories of Squamish hiking a pleasant one. If you have a dog, best to leave it home as it is very tricky for dog travel over the roped areas. The actual distance back to the parking area ranges from 2 kilometers to over 6 kilometers depending upon who was telling it and how tired they were. You want to do this trail on a dry day in the late spring or early fall. Hiking Guide. Explore the many fabulous hiking trails on your doorstep.